The 2019 Masters purse is the richest in the tournament’s history, with $11.5 million ready to be split 65 ways — a $500,000 increase from last year. The winner will receive the a whopping $2.07 million, with $1.24 million going to the runner up. It’s an awesome payout to be sure, but how does it compare to other events? In the world of golf alone, the Masters is not even the richest event on the schedule. The largest purse in the game is actually at the Players Championship, which offered a massive $13.5 million purse in 2019, with $2.25 million going to winner Rory McIlroy. The U.S. Open had a $12 million purse in 2018, with champion Brooks Kopeka taking home $2.16 million, while the PGA Championship had an $11 million purse with $1.98 million also going to the winner, Koepka. The British Open has the smallest purse of any major golf event, with $10.5 million total and $1.89 million going to winner Francesco Molinari in 2018. If those numbers sound big, they’re actually nothing compared to another major individual sport. The 2018 tennis U.S. Open had a $53 million purse, with $3.8 million allotted to each singles champion. The Wimbledon payout is a bit smaller: a $45.5 million purse with approximately $2.98 million allotted to the singles champs. When it comes to other professional sports, number vary greatly. Major sports leagues usually generate bonus money from a playoff pool fund. When the Patriots won the Super Bowl this year, the NFL awarded each player on the team $201,000. The world of baseball fared a bit better. When the Boston Red Sox won the 2018 World Series, they were entitled to a payout of $416,000 each. The Golden State Warriors players’ estimated payout for their 2018 NBA Finals win was around $221,000 each. For 2018 Stanley Cup winners the Washington Capitals, the bonus was estimated to be around $174,000 per player. 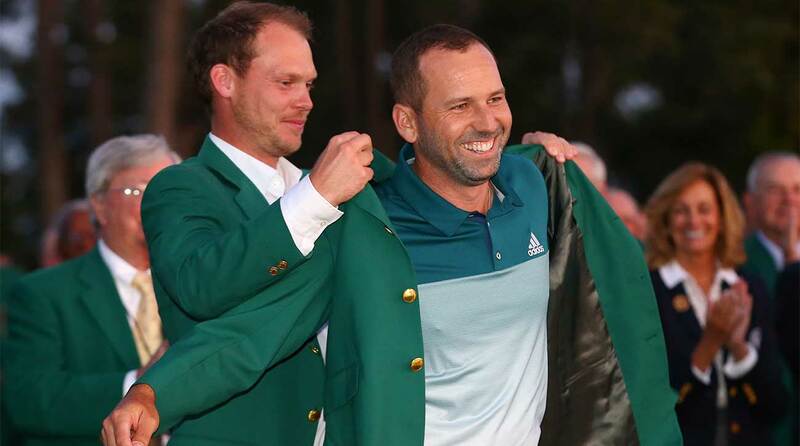 Danny Willett puts the green jacket on Sergio Garcia after Garcia won the Masters in 2017. This year's winner will receive a record payout. In the World Cup, FIFA allocates money to winning federations, which can distribute it as they see fit. In 2018, that number was $38 million to winner France, resulting in a likely payout of at least $410,000 per player. How about the Daytona 500? The legendary race no longer publishes purse payouts, but the winning driver is estimated to take home north of $1.5 million. In the world of horse racing, the Kentucky Derby is the richest purse of the three triple crown events. Last year’s winning horse, Justify, took home $1.24 million. All things considered, professional golfers have it pretty good — especially when it comes to the Masters purse.